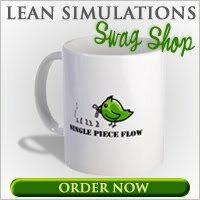 Looking for a cheap lean simulation? Look no further than your own supply cabinet. It's amazing what you can do with a simple sheet of paper. Tom Curtis (@onimproving) created this presentation on Slideshare offering up 22 ideas for lean simulations with a ream of copy paper. Some of the ideas I've covered here before, including paper airplane folding, origami, cutting snowflakes and plain ol' paperwork, but there are a few new ones to tease the brain. How about a garbage can toss? Perhaps you can tune your trajectory using some six sigma tools. . .
Or fixing sentences? Call the grammar police and create a sheet of documents that have to be edited. Making hats? Like airplanes and origami, your paper can be converted into a hats with a simulated factory in your office. This little presentation doesn't give you the full details for running a lean game, but will give you plenty of ideas for how to create your own. Lean simulations don't have to be complicated affairs. You can create a simple activity that shows push vs pull, line balancing or standard work as long as you have a mini process that takes several steps. Get out the copy paper, set up a few tables and get started! 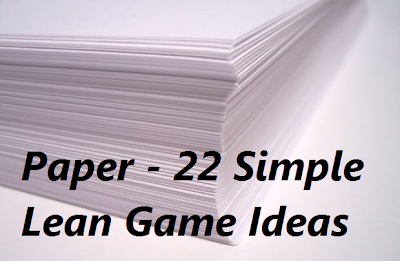 What lean games have you tried using just a simple piece of paper? Check out my entire collection of free lean simulations and games! I would like to thank you for the efforts you have made in writing this article. I am hoping the same best work from you in the future as well. In fact your creative writing abilities have inspired me to start my own blog now. Really the blogging is spreading its wings rapidly. Your write up is a fine example of it. Well I have also made an article hope you go through it. Info is really nice and I like your style to write full info in deep to help like us who don’t know about this, really helpful. I have also gone through your other posts too and they are also very much appreciates able and I'm just waiting for your next update to come as I like all your posts. I also recommend your valuable readers to visit here for JSC Result 2018 of Bangladesh Education. Thank you so much again. Hey, nice post. It is really useful for every one who wants to know about the Parenting workshops for corporate. I am really impressed to read it. You wrote everything in manner and useful ways. Good work. Keep it up. Thanks for sharing...! !